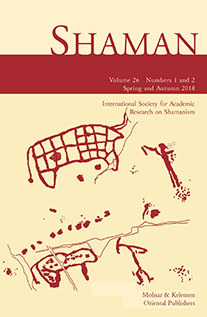 The First Conference of the International Society for Shamanistic Research was held in Seoul, Korea, between 22â€”28 July, 1991. The conference, organized by Tae-gon Kim, president of the Eastern Office of the ISSR, had “Regional Aspects of Shamanism” as its central theme. The event was an enormous success, as more than 80 papers were presented by participants who came from more than 20 countries, and it offered an opportunity for colleagues from East and West to meet. After the opening ceremony, two papers were presented at the plenary session “Shamanism and Korean Religions” by Yee-hum Yoon and “Shamanism: Structures and Symbols” by MihÃ¡ly HoppÃ¡l. The afternoon session was dedicated to the theme of shamanic performances and then there followed a traditional Korean tea ceremony. During the three working days of the conference, presentations were held in five different sections: “Shamanism and Religion”, “Shamanism and Folklore”, “Shamanism and Medicine”, “Shamanism and Art” and “Theoretical, Historical and Philosophical Issues of Shamanism”. During the last two days of the conference the participants were taken to observe some local shamanic rituals which gave a glimpse into the highly elaborate character of Korean shamanism. Thanks are due to the sponsors of the conference, the Korean Ministry of Education, the Korean Culture and Art Foundation, the Korean Science and Engineering Foundation, the Dong-A Publishing and Printing Co. Hd., the Kyung University and the Institute for Ethnological Studies of the Han Yang University, all of which generously provided financial help to the scholars attending from ex-socialist countries. The First International Conference of the ISSR has made history, since it brought together for the first time Western and Eastern scholars in a country where shamanism is a continuous and living tradition. There are plans for publishing the proceedings of the conference in Korean and Japanese. The papers given in English will be published separately, Otto von Sadovszky having offered a generous grant for the purpose from the International Society for Trans-Oceanic Research (ISTOR). The Scientific Committee of the ISSR (1991â€”1993) nominated by the General Assembly in Seoul, Korea: Vladimir N. Basilov (Russia), Rolf Gilberg (Denmark), Roberte Hamayon, Treasurer (France), Ruth-Inge Heinze (USA), MihÃ¡ly HoppÃ¡l, President of the Western Office of the ISSR, acting president, 1991â€”93 (Hungary), Caroline Humphrey (United Kingdom), Ulla Johansen (Germany), Tae-gon Kim, President of the Eastern Office of the ISSR, acting president (Korea), Juha PentikÃ¤inen, President of the Northern Office of the ISSR, (Finland), Otto von Sadovszky, Treasurer (USA), Bernard Saladin dâ€™Anglure (Canada), Tokutaro Sakurai (Japan), Anna-Leena Siikala (Finland), Giovanni Stary (Italy), Fu Yuguang (P.R. China). Founding members of the ISSR, Seoul, Korea, July 25, 1991: Eduard Alekseev (Russia), Catherine Barbier (France), Jacques Barbier (France), Marie-Lise Beffa (France), Bill B. Brunton (USA), Josiane Cauquelin (France), Ronald Chavers (Holland), Maria Silvia Codecase (Italy), John A. Dooley (United Kingdom), Dashinina Dagurov (Buriatia), Alex Guillemoz (France), Roberte Hamayon (France), Ruth-Inge Heinze (USA), Eugene Helimski (Russia), MihÃ¡ly HoppÃ¡l (Hungary), Roger L. Janelli (USA), Ulla Johansen (Germany), Shin-pyo Kang (Korea), Laurel Kendall (USA), Seung-mi Kim (Korea), Tae-gon Kim (Korea), Kahili Serge King (USA), Peter Knecht (Japan), Martin Kraatz (Germany), Hyeong-gi Kwon (Korea), Heimo Lappalainen (Finland), Du-Hyun Lee (Korea), Mee-won Lee (Korea), Young-yae Lee (Korea), Seiichi Matsumoto (Japan), Hui Qin (China), Il-young Park (Korea), Sang-kyu Park (Korea), Alessandra Pozzi (USA), Otto von Sadovszky (USA), Bernard Saladin dâ€™Anglure (Canada), Geoffrey Samuel (Australia), Giovanni Stary (Italy), Frank M. Tedesco (Korea), Takashi Tsumura (Japan), GÃ¡bor Vargyas (Hungary), Manabu Waida (USA), Snjezana Zoric (Croatia), Takako Yamada (Japan), Kinichi Yamashita (Japan), Dawn-hee Yim (Korea).